The Salty Cookie Co. is a small cookie-centric bakery who sells through markets and private orders only. Behind these sweet, salty, chewy delights is mom-of-two, pastry chef Meredith Kaufman, who makes three simple yet fabulous flavours: brown butter chocolate chip, spicy ginger molasses and salted brown sugar. 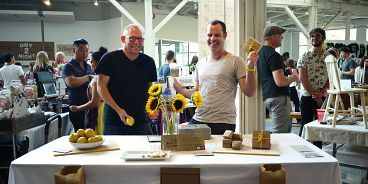 Another exciting vendor was The Lemon Square (pictured above), a small-batch, highly specialized company launched by two passionate guys, namely Wally Mitchell and Daniel Spratling. I can easily say this is the best lemon bar I have ever tried. Notch Coffee was also new and shiny at Hawkers. These young, passoinate guys are all about seasonally selected, transparently sourced, hand-brewed cold brew.